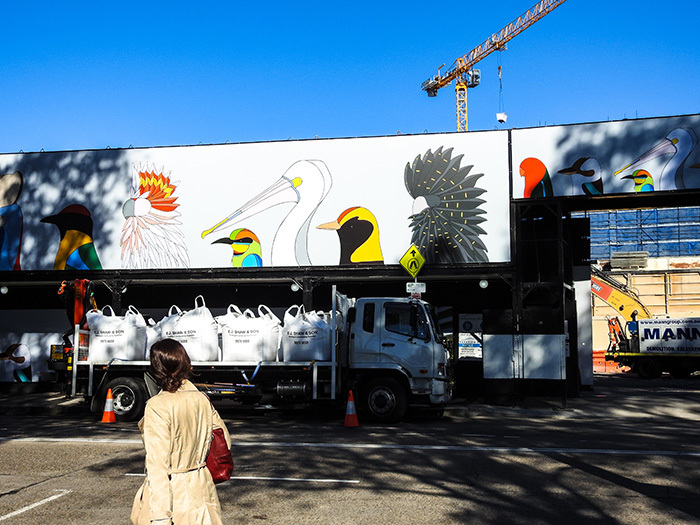 To make streets more beautiful while construction is underway, the City of Sydney is making designs by 10 Australian artists, illustrators and photographers available to property developers to use as temporary hoardings. 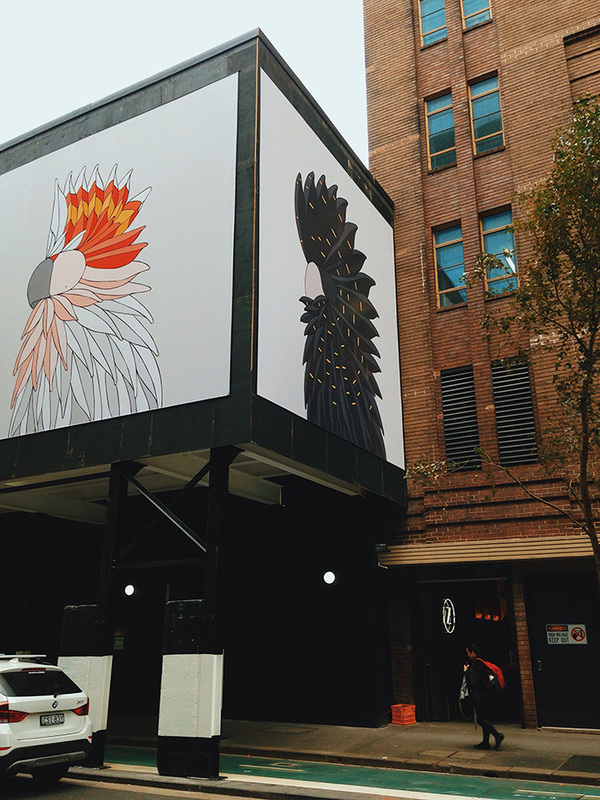 The open call-out attracted over 520 submissions and 10 artworks were chosen to feature on Sydney’s streets, being seen by thousands of people. 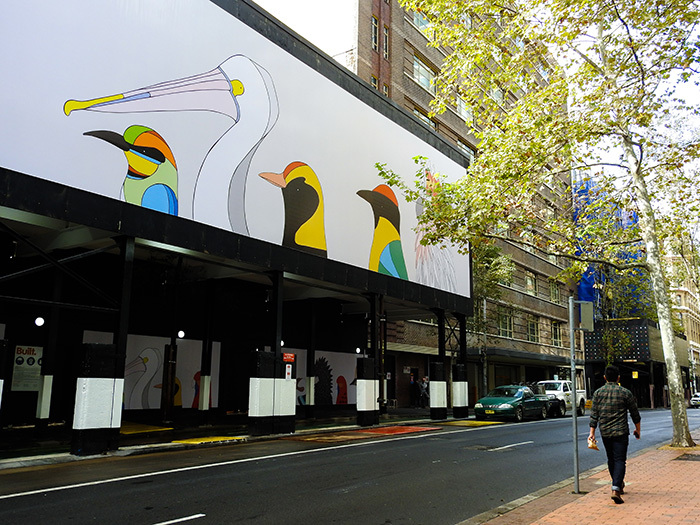 Our submission, Birds of Australia, is one of them. 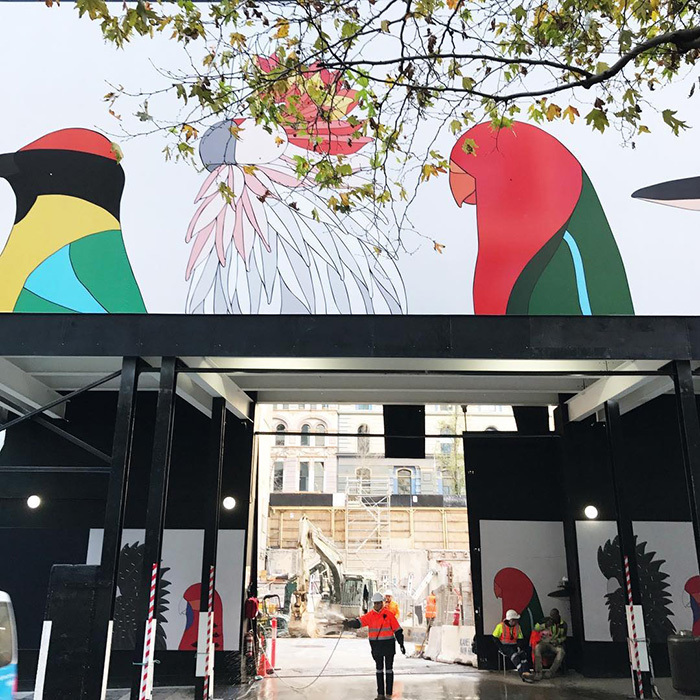 “This program will bring the temporary hoardings around building sites to life, making them works of art in their own right,” Lord Mayor Clover Moore said. 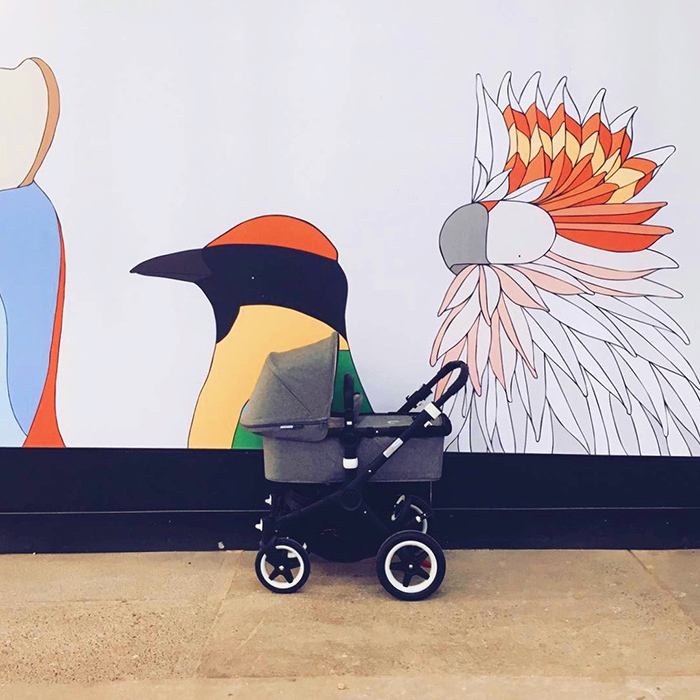 “We want to make sure our public spaces are as attractive and welcoming as possible for the 1.2 million people who live, work or visit the city every day”. It is an incredible opportunity and window for showcasing our work, allowing us to create relatable and iconic subjects that involve the entire community. 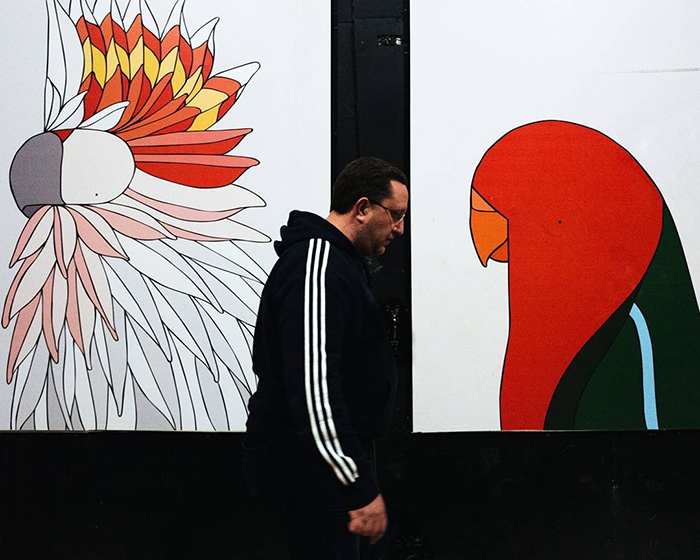 Art affects people’s feelings and this creates emotional connections with public spaces. We seek to inspire and touch upon positive emotions, empowering city dwellers in an attempt to spark the public’s creativity to actively participate in shaping a better future by speaking from a position of hope. 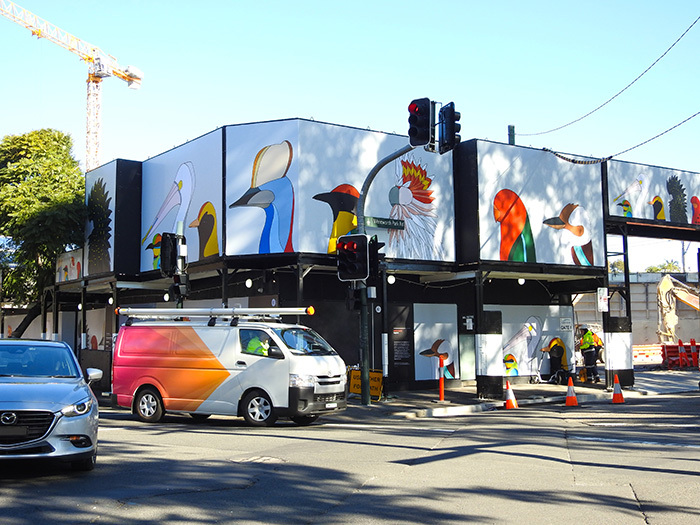 Birds of Australia was inspired by the greatness, uniqueness and ecological power of Australian birds and their role in shaping our landscape. Australian birds are more crucial to the pollination and distribution of plants here than anywhere else on the planet. I hope it helps change our understanding of nature because to protect the environment we must first undergo a cultural transformation. Our aim is to reconnect an increasingly disconnected human population with the environment of the planet that we not only come from but also rely on. Current locations: Kent St 321, Intersection Bay St and Wentworth Park Rd.